a number of tools that can be used, it’s maybe the grass strimmer that is the most versatile. As well as being able to create tidy borders, a grass strimmer can also be used to deal with the more difficult terrain we come across. However, in order for our grass strimmer to serve us well, we have to ensure that we know as to which model is best suited to our needs, and how that particular model should be used. While a grass strimmer is fairly straightforward when it comes to usability, it doesn’t hurt to take on board a few pointers. It would be easy to assume that all grass strimmers work in much the same way, but there are various models that rely on different sources when it comes to power. The main options consist of battery-powered motors, two-stroke petrol mowers and mains-powered. The option that’s right for you can depend on several varying factors. For example, are you merely working on your own garden, or will you be carrying out professional services? You also need to take into consideration as to how cumbersome the job at hand is, as an inferior grass strimmer pitched against difficult terrain could mean that the job is much more difficult than it has to be. The petrol strimmers available are considered among the most powerful, so are often employed to deal with tasks that have difficult terrain to deal with, or consist of a large area. They are also popular because of their mobility. As there are no trailing wires, keen gardeners can get to work as long as there is petrol in the tank. Two-stroke engines are often detailed using “cc,” just like a vehicle motor. Those who are dealing with bracken and shrubbery will find that a petrol-powered grass strimmer will serve many different purposes, and can even come with detachable extras to ensure that your overall job load is much lighter as a result. Extras can include attachable items such as a bush-cutter, depending on the model you purchase. There are also petrol garden multi-tools which have various attachments and offer more versatility. Of course, not everyone has a difficult garden to contend with, so will be more than happy with a grass strimmer that is suited to smaller gardens and lighter workloads. If you’re something of a tech fanatic, you will need very little introduction to lithium-ion batteries. They are commonly used in a slew of mobile devices such as tablets and smartphones, but have now found their way into the gardening industry. As such, battery-powered cordless strimmers are a new addition that are lightweight and fully mobile, allowing you to carry out duties in the garden, while being completely free of any wires. However, if you plan to cover a larger area throughout the day, then you may find a battery-powered solution limiting, as it’s likely your grass strimmer will have to be charged every 20 minutes. This evidently won’t be a problem to those who only have a small area to work with, or have access to some interchangeable batteries. Of course, this shouldn’t be viewed as an option that’s of no use, you simply need to ensure that the solution you decide on is going to be able to cater to your needs without making the job any harder than it has to be. It should also be noted that some of the battery-operated solutions are actually part of a bigger picture, as they allow the battery to be used with other tools within the brand, so it could actually be something that suits you needs. If you have to stick to a budget, then you may want to opt for something that’s a little more affordable, but still effective. Electric strimmers serve a purpose, although you won’t get the same flexibility you get with wireless options, and it’s unlikely you will be able to deal with rough terrain. However, if you’re merely looking for a solution that is able to contend with the day-to-day maintenance of your garden, then a mains-powered solution can be a worthwhile consideration. Another noteworthy benefit of a mains-powered solution is that you’re not reliant on batteries and fuel, meaning that you’re not likely to suddenly cut out when dealing with your garden. While many of us will be fully aware as to what a trimmer looks like, not everyone will be familiar with what the various functions offer. Some may have more features than others, but the following is a breakdown of the features commonly found on a grass strimmer. While it’s evident that the motor is the driving force behind your grass strimmer, not everyone will be aware that the bigger the motor is, the more powerful it will be. While a larger motor will mean that you have more power as a result. As the motor is the main component of the grass strimmer, it should be noted that the bigger the engine is, the heavier the grass strimmer will be as a result. In this regard, you should balance as to how much weight you can carry along with how much power you need. Petrol strimmers will usually have two-stroke engines, which will run on a mixture of two-stroke engine oil and unleaded petrol. The benefits of such an engine mean that it is unlikely that your strimmer will cut out in the middle of a job. The pull-start can also be referred to as the rip-cord, and is the starting mechanism found on many, if not all, petrol mowers. If you have a good-quality strimmer, then you should find that starting the grass strimmer is as simple as a couple of pulls of the chord. As you can imagine, the pull-start can go through some serious wear-and-tear, so it would be advisable to opt for a brand that is able to offer spares and accessories for your tool. The start switch will function differently depending on the type of grass strimmer you have. If you have an electric strimmer, the pressing the button will simply start the strimmer. However, a petrol strimmer will require you to switch the strimmer on, and then use the aforementioned pull-start. The petrol tank is normally located towards the top of the strimmer, and is where the fuel for your grass strimmer will be placed. Although you should ensure that you have enough fuel for the task you need to carry out, you should also ensure that there in excess fuel left in the tank when the frass strimmer is not in used. Depending on the weight of the strimmer you’re using, you may find that it comes with a harness bracket. This allows you to work comfortably without the weight of the grass strimmer becoming an issue. It is also normal for you to be able to choose where the bracket sits on the grass strimmer. A choke lever is vital for petrol strimmers, as it allows for an easy engine start. The choke is closed when the grass strimmer is first started up, and then closed once the engine is running. While this is required for a cold engine, it can be side-stepped if the engine is warm, meaning it can be started from the choke open position. Many may not consider the handle as important, and in many instances, they very rarely differ. However, the handle of your petrol strimmer can make all the difference as to how comfortable you find the grass strimmer while it’s in use. With this in mind, you should look for a good quality strimmer, that has a series of grips that look to minimise the vibration of the unit while it’s in use. Mostly found on higher end petrol strimmers, a priming bulb helps the fuel circulate around the strimmer in the right way. 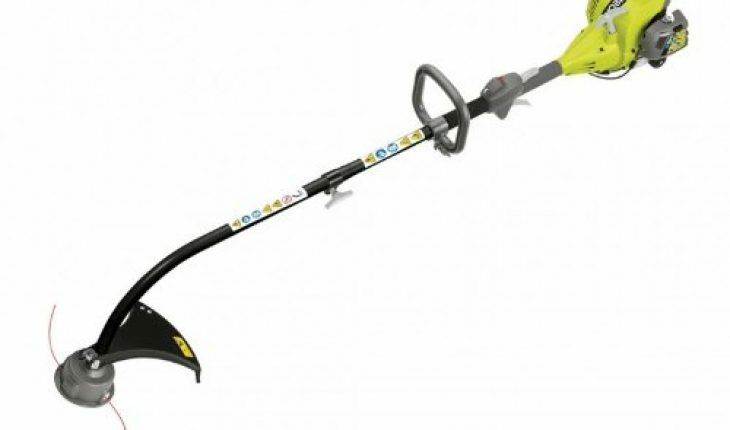 This will ensure that your strimmer starts without any issue, even if the engine is cold. The throttle trigger will allow you to control the speed of your spool, as well controlling the level of power the grass strimmer uses while in operation. The guard on a grass strimmer allows you to protect yourself against any debris that may materialise when using the grass strimmer. The spool of the strimmer is where your line will be stored, and can often be fed using a bump system. If the line is to break and become worn, then you should find that a couple of simple taps is enough to feed you some new line. When we use a grass strimmer, the quality delivered can sometimes be attributed to the length of the line. If it is too long, then you could find that your workmanship isn’t as professional as you’d like. Fortunately, a tiny blade known as a line cutter can ensure that your line is always the correct length. The strimmer line is one of the most important aspects of your grass strimmer, as it will be what allows you to clear any vegetation at ease. During normal use, the line will wear, so you will need to replace when the need arises. Before purchasing replacement line, you should refer to the manual you received with your strimmer to ensure that you are ordering the correct replacement line. While you need to ensure that you’re using the right kind of strimmer, you also need to ensure that you’re using in the right way. As such, you should consider some other factors to ensure that your gardening endeavours yield the best results. While you may not consider the garden to be a dangerous area, it can actually throw up a series of dangers if you’re not wearing the right protective clothing. As some strimmers are more powerful than others, then the clothing you purchase could differ. However, the general rule-of-thumb is to purchase a helmet, goggles and protective shoes. This will ensure that you’re fully protected against any debris. While this won’t be a problem for those using a battery-operated or petrol solution, those using a mains-powered solution will need to ensure that they’re fully aware of where the cabling lies while the grass strimmer is in operation. The cabling on electric strimmers is very robust, and many strimmers will have some kind of built-in safety feature, but this doesn’t mean we shouldn’t put our own safeguards in place. As such, we should try to ensure that we’re fully aware of where the cabling lies when we’re maintaining our garden. For example, if we’re working in a areas where the grass is a little longer, then we need to ensure that we’re fully aware of it. If you do find that a cabled solution is too much for your current project, then it would be advisable to seek something out that’s a little more suitable. While there’s nothing wrong in working to a budget, it’s certainly not worth risking your life over. There is no wrong or right type of strimmer, only one that suits your needs. As such, you should only make a purchase if the strimmer in question suits your needs. While there’s no harm in asking friends and family their opinions on grass strimmers, you still need to carry out your own research to ensure that you’re making a purchase that is going to serve you well moving forward.